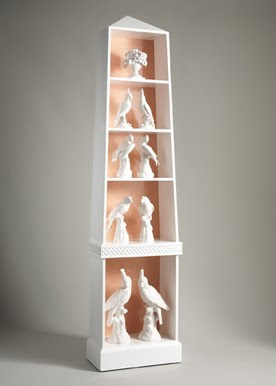 What is the perfect backdrop for your Chinoiserie collection of Blanc de Chine? Would you go dark? White? A pattern? Perhaps a dramatic color? 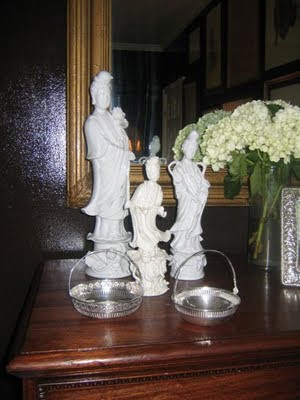 For much more on using Blanc de Chine in your home, click here. definitely darker for contrast -don't you think? I mean -you even put it as the first picture! I'm with AD on this one. But then, I am seriously thinking of painting my stairway in black matte/gloss stripes. 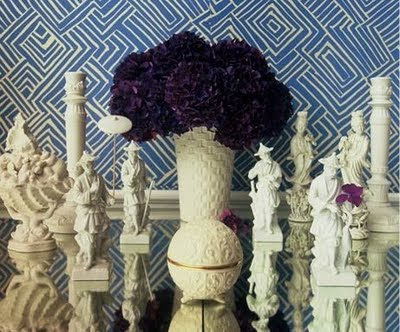 The white on white is attractive in a very conservative way, making the collection look more like a pattern than a WOW! I love the dark backgrounds best, especially that navy. oh, blanc de chine, why are you so good to me?!? 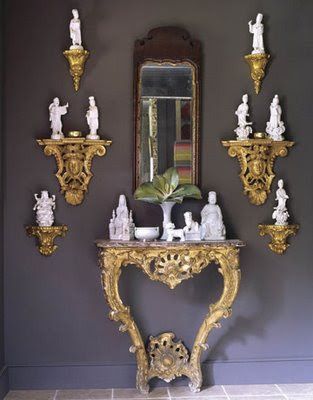 i love it next to dark, chocolatey walls and dream of a day when i can live in a white room accented with white chinoiserie - but it will never happen given my realm of dogs and boys! Agree with ad, the contrast definitely brings out the beauty in the Blanc de Chine! 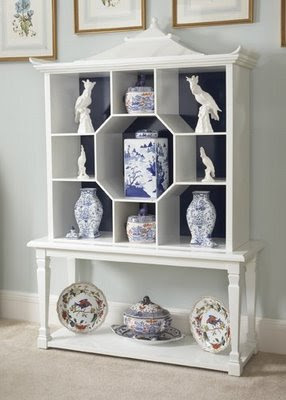 Love Blanc de Chine, have a collection myself! While I adore it against the dark background mine is in a sea of Belgian linen, seagrass, ivory silk and driftwood:) Thanks for the post! Gotta be a dark background for me! It is such a strong statement. Great post Beth. 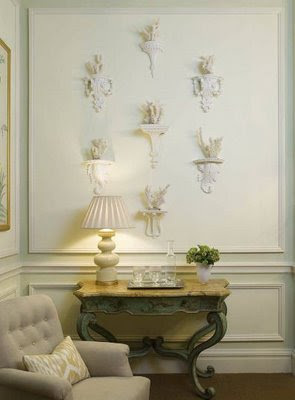 I would have my much loved colour - celadon green. I would want the china to show off but not in the dramatic way contrast colour does. Stefan-I do love that first picture-I love all the elements in it. Home Before Dark-I love the idea of a black on black striped hallway. I actually like the Blanc de Chine against both the dark and light. Both are wonderful. Kitty-"To dream, the impossible dream...."
Theresa-I love the idea of aubergine with Blanc de Chine. 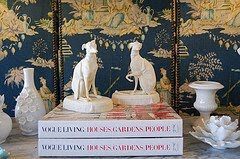 Lady Jicky-A girl after my own heart-celadon is the correct answer to so many questions-it looks good with everything. 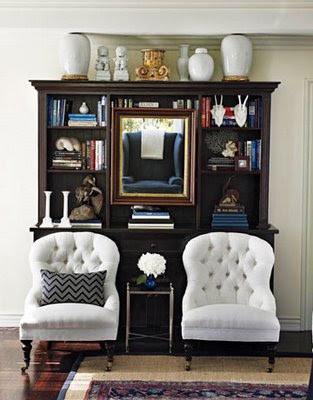 I love the idea of white on white, especially with all of the white porcelain. Especially with accents of gold. Also love the delicate peach shade. Lauren-Me too-stunning. Thanks for stopping by. Love them all. It would be so hard to choice. CC-I agree-they are all lovely. wow, what a difference color makes. so much with the ben moore iron mountain. love the warm sheen of the stark white against the matte brooding grey. Soodie-That is a wonderful color-and I like how the baseboards are painted the same color.